Don't fret, to my not so very vast knowledge Crystal Gayle is fine and dandy and is probably performing in Branson as I type. However, I am mourning our resident little person's decision to say goodbye to her Crystal Gayle-like hair. Unlike Crystal's hair, it wasn't long enough to sit on, but it was still a lengthy ways down her back. Her long hair has been the epitome of little girl girlyness to me for, well...ever. Annelise had been begging for a haircut for months and her pleas had always fallen on deaf ears. Annelise thought it was pretty neat to be able to share her ponytail with another boy or girl that needs it through Locks of Love. Snip, snip and it was GONE, baby gone. Yes. Except my eyes are green. Annelise thought it was all over and she loved it just the way it was, grinning from ear to ear in the mirror at her new, yet quite uneven self. Thankfully the lady convinced her she wasn't quite finished and she would like it even more once it was shaped up. 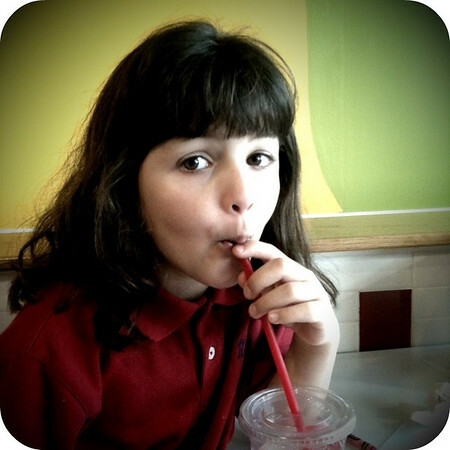 A few more snips here and there and instead of my long pony-tailed six year old, I was staring at a different child. One who looked instantly older. Who was this little girl? She was beside herself with pure new hair-do joy! For the next few hours (until she fell asleep really) she was checking her new look in the mirror--or any reflective surface--and was mighty pleased with the results. And she woke up the next morning still enthusiastically in love with her haircut. Mama is still taking deep breaths (it's growing on her). Again, who is this little girl? Don't it make my brown (green) eyes blue? Whoever she is, she looks so much older, way more mature. There she goes, new haircut, stuffed cat (Kit), purse (one of my hand-me downs she claimed), rolling luggage and all on her way to visit Pappo and Grandma. I hope they recognize her. When I clicked over to your blog after reading your title on my RSS feed, I was thinking "Oh dear, I didn't know Crystal Gayle died." So I'm glad she's alive and well. Annelise's new look is mighty cute, and I'm sure this will be much easier to manage. It's so great that she donated the rest to Locks of Love. I also thought that Crystal Gayle died! And I live near her! ack! I had the Crystal hair do. Or the Marcia. Nah...Crystal is better! My Aunt begged my Mama to let me cut it in 8th grade. I wish she hadn't succeeded because my hair has not been the same in shine since :) It WAS just past my fanny. 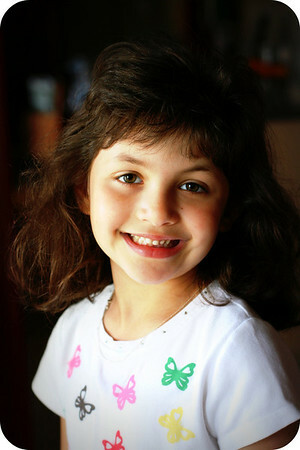 A. looks more grown up now....G grew hers out for locks of love years ago. I must say, she has never wanted long hair again....TANGLES! she is a cutie! 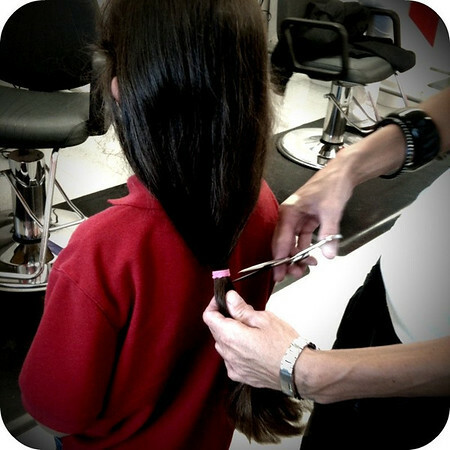 i did the same thing friday afternoon...13" to locks of love! Aw, she is ADORABLE. She does seem to be growing up so fast. Especially when one looks at the size suitcase she needs to go next door! Okay, at second glance the suitcase isn't a suitcase at all - there I go trying to crack a joke and failing :) She's just a girl after my own heart, that's all. Gotta be prepared! 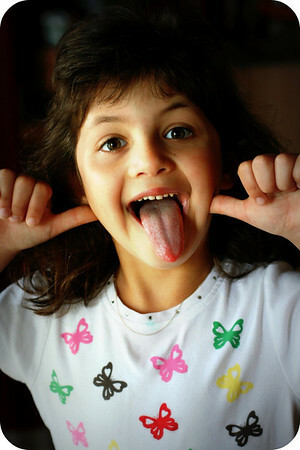 I remember when my little girl did that and she could sit on hers! 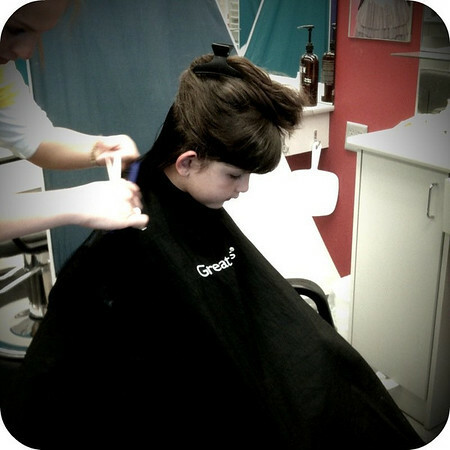 she did locks of love 3 times and decided she would not grow it out that long again…too much trouble!